Leo Diamond presents a beautiful 1ct diamond in a classic solitaire design, loved by many for its timeless appeal and how it gracefully raises the diamond into prominence. The Leo Diamond is a product of four generations of expertise in the art of diamond cutting, resulting in the first diamond that was independently certified to be visibly brighter than other diamonds with 8 additional facets compared to traditional round brilliant cut diamonds. Leo Diamond rings are independently certified by the IGI/GSI for colour, clarity, carat and cut. 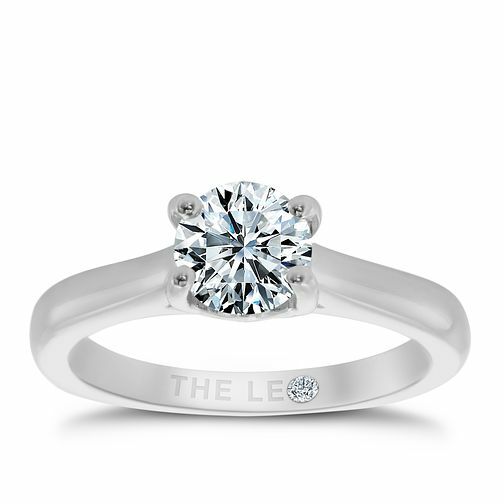 Leo Diamond platinum 1ct I-SI2 solitaire ring is rated 5.0 out of 5 by 3. Rated 5 out of 5 by Anonymous from Stunning ring Just received my Leo diamond ring. Absolutely stunning well worth every penny. The diamond is very good quality. Rated 5 out of 5 by Anonymous from Stunning beautiful ring I am a proud owner of a one carat Leo platinum ring. I fell in love with it the minute I placed it on my finger! Luckily, my husband agreed and so I get to look at this ring every day. The platinum mount is extremely attractive and the diamond glistens in the light due to the quality of the diamond and skill in of the craftsmanship. I will treasure the ring forever!